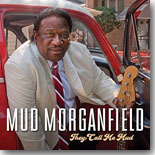 Mud Morganfield continues to follow in his famous father's footsteps with still another fine album, They Call Me Mud, for Severn Records. It's this month's Pick Hit. Arizona blues entrepreneur Bob Corritore has consistently taken many of the legends of the blues into the studio when they pass through the area, producing quite a few great albums in the process. His latest, Don't Let The Devil Ride!, is our Surprise CD of the month. This month's Flashback feature takes a look back at one of B.B. King's classic live albums, Live In Cook County Jail. Our What's New section features new CDs from Long Tall Deb & Colin John, Victor Wainwright, Brigitte Purdy, Myles Goodwyn, Katy Guillen & the Girls, Gus Spenos, Victoria Ginty, Allman Goldflies Band, Tommy Dardar, and more.